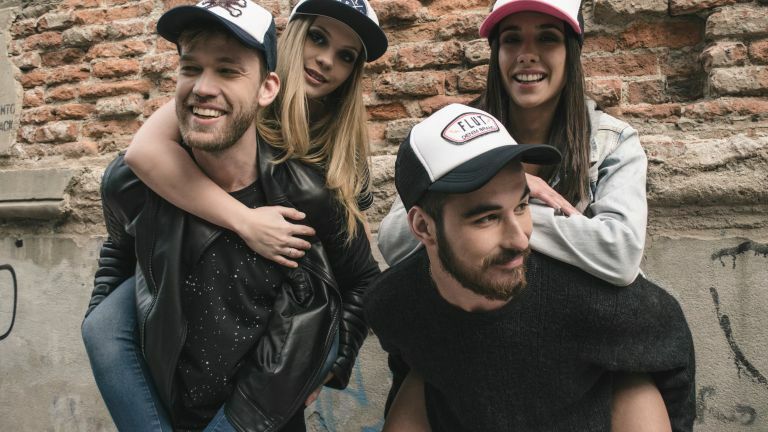 Whether you survived the VonDutch days and have found yourself here out of nostalgic curiosity, or you’re part of the new wave who’s wondering what that nifty new headwear is that Justin Bieber and Kylie Jenner have been repping all over the ‘gram, the fact remains the same: for better or worse, trucker hats are back. And, as luck would have it, if you’re looking to try your hand at the trend, the best trucker hats are all here in one place for your browsing pleasure. But if going the whole mesh-backed hog is a little rich for you, not to worry. We’ve included a couple of snapbacks in the mix too, for that same high profile and adjustable strap, but with a little more longevity than the trendy trucker can perhaps offer. If you like a real statement hat, our number one Moschino’s Crazy Fruits printed snapback, as designed by sartorial maverick Jeremy Scott, is the one to go for. For something a little more low-key, go for that same snapback shape in a pared-back palette, a la Alexander McQueen, New Era and OBEY. How outdoor adventure clothing brand Patagonia suddenly came to be one of the most popular streetwear brands of the past couple of years we have no idea, but the tastemakers are clearly onto something. This Patagonia cap is pure cool: with that unmistakable (and, we must say, really rather attractive) branding the only pop of colour, the all-black-everything design makes it easy to match with a huge range of ensembles, and the pre-curved visor keeps things slightly closer to baseball cap territory. Regardless of whether or not the Raiders are actually your team (now’s the time to finally call in those old Californian family connections) this New Era collab is working to make them one of the most well-merched around. As elegant as a snapback can possibly be, there’s a lot to love about this hat: the font, the subtle Raiders crest, the comfy six-panel construction and curved brim. All in all, it’s a pretty adult take on the trend. Like VonDutch, Vans was a huge deal in the early ‘aughts, and while you might not see so many checkered slip on shoes around these days, the skate brand is still a firm favourite. That ‘off the wall’ charm is perfectly encapsulated in this laid-back trucker hat – forget the black and white colourways of the Oakland Raiders and McQ Alexander McQueen hats, heck, why not make the logo black too? More out-there alt kids can take advantage of the block colours also on offer, but when it comes to subtle branding, the black-on-black is hard to beat. Basically the antithesis of our first pick, this McQ Alexander McQueen snapback retains that signature shape and flat peak, but keeps things low-key with an almost-all-over black design, save for a single stark logo in white contrast stitching. If you like the snapback shape, but would rather make a statement in a whole different way, this monochrome offering is the way to do it. An all-neutral palette makes matching with any off-duty outfit a cinch, while the oversized snapback style speaks for itself. Extra cool points for collabs? Yes please. What was it that we were saying about monochrome? This classic trucker-style snapback from OBEY is all about scoring you those street style points, but without making you look like you’re trying too hard to infiltrate a cool sixth formers’ gang. Eschewing their usual Futura (that’s right, font nerds) for a new twist on the logo, this black and white snapback is fresh from the brand’s collaboration with East Coast horror punk band Misfits, and it shows. Feeling brave? This fruity topping is sure to turn heads. Maverick designer Jeremy Scott’s Warhol-like tendencies are in full swing at Moschino right now, as evident in this amazingly over-the-top snapback, featuring the collection’s colourful, chaotic Crazy Fruits print. It’s a statement hat for sure, so we’d say it’s all the accessorising that needs to be done with a tee and jeans combo, and while it lacks the traditional mesh of a trucker cap, it foregoes none of the summer-friendliness thanks to a naturally breathable 100% cotton construction.